Aadi Amavasya is the no moon day in the Tamil month of Aadi and is considered highly auspicious for performing rituals to the dead like Shradh and Tarpan. Aadi Amavasai 2019 date is July 31. The day is also auspicious to Lord Muruga. Important rituals on the day include performing rites for dead ancestors in sacred Teerths and riverbanks and also taking a holy dip in sacred rivers and spots. 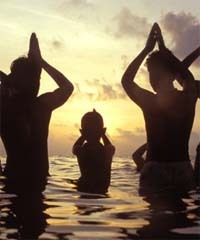 Devout Hindus perform holy bath in various scared rivers, seas and sacred ponds or Teerthams in Tamil Nadu. Thousands of Hindus take a holy dip and perform rites to the dead ancestors at Agni Theertham in Rameswaram, Thriveni Sangamam in Kannyakumari and various holy spots on the banks of Cauvery River. Fasting on Aadi Amavasai is considered highly beneficial and some people only have a single meal on the day. Aadi month is of great importance to Lord Muruga and on Amavasai day special abhishekams and pujas are held. It is also widely believed by Muruga devotees that one will be purified and all sins will be washed away by taking a holy dip in the Shanmuga River in Palani on the Aadi Amavasya day. As a mark of respect and thanksgiving people also tonsure their head at Palani Muruga Temple on the day.